Here are the most crucial and useful SSD maintenance tips to bear in mind. Solid-state drives have gone from being an overpriced curiosity to a must-have. It's still not cost-effective enough to replace all spinning-platter drives with SSDs, since conventional hard drives are still far cheaper on a buck-per-gig basis. But where raw throughput and IOPS are crucial, SSD wins hands down. From the maintenance side of things, though, an SSD demands a different approach than a spinning drive. With that in mind, I've compiled some of the most crucial and useful SSD maintenance tips to bear in mind. This bears repeating and elaborating on, even if it's something widely known by this point. SSDs do not need to be defragmented, since every byte on the drive has the same access time, whether via random I/O or sequential reads. Defragmenting such a drive doesn't provide any discernible performance improvement and constitutes a waste of drive bandwidth (although I'm dubious that it shortens the lifespan of the drive in any appreciable way; see below for more on that score). At this point, most operating systems are able to detect the presence of an SSD and configure themselves accordingly to avoid defragging an SSD. Windows 7, for instance, detects the presence of an SSD when the OS is installed and doesn't automatically add it to the schedule of the defrag utility. However, an SSD added after the fact -- or used as a replacement for an existing drive with the same drive letter -- may not be automatically excluded. 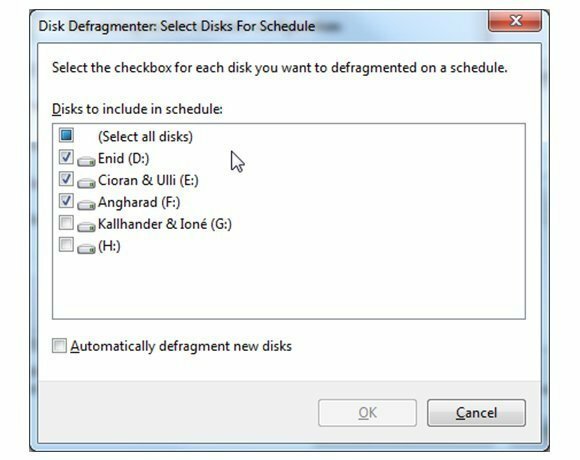 Make sure any SSDs are excluded from defrag by opening the Configure Schedule in Disk Defragmenter, then selecting Select Disks and making sure any SSDs are unchecked. If the SSDs don't show up at all in that list, then you're good to go. The C: drive is missing from this list because it's an SSD and was automatically excluded by Windows. Don't worry about the lifetime of the drive. When SSDs first appeared on the market, the most common objection to them involved the limited number of writes each memory cell could sustain. The flash memory used in SSDs does have a lifespan, typically on the order of 100,000 to 1 million writes per block. But to say that this makes SSDs unsuited to everyday production use is both unrealistic and unfair. SSDs, and flash devices generally, use a technique known as "write leveling" to lengthen the lifespan of the drive. When cells are written to on the drive, the leveling mechanism ensures that the entire drive's complement of memory is used fairly for writes, instead of just the same cells over and over again. This, by itself, greatly lengthens the life span of the drive. It's enough that the average life span of an SSD drive, even in a write-heavy scenario, is probably far longer than the time the drive will remain in production use before it's replaced by a far faster, larger and even more wear-resilient model. Some people who are concerned about SSD maintenance have opined that, with a system that uses an SSD system drive, you'll want to shut off hibernation or move the swap file to another drive. The first is pointless. Notebooks that ship with SSD system drives use the SSD for hibernation and are none the worse for it. The second suggestion has the germ of a good idea in it, but is often implemented wrong. If you have a system with an SSD and other spinning-platter drives, you may want to put the bulk of your swap on something other than the SSD -- but that's mostly for the sake of parallelism or I/O bottlenecks and not because of worries about the device's lifespan. Hosting companies, for instance, are known to use SSDs as swap-only drives for some of their server clusters without being too concerned about the drive's lifespan. In short, the lifespan of the drive -- barring cases where the drive is actually defective -- shouldn't even be an issue. If you're curious about the actual numbers, Max Schireson did some number-crunching and came up with a figure of five years or so, based on worst-case scenarios in a database server environment. Don't worry as much about ventilation or cooling. SSDs produce far less heat and are also far less affected by heat than their spinning-platter counterparts. To that end, they can be used safely in environments where cooling or airflow is minimal without worrying about lifespan or performance. SMART statistics (from the Self-monitoring, Analysis and Reporting Technology open standard) are reported by many varieties of storage devices, including SSDs. The variety of stats returned by the drives varies a great deal, based on the manufacturer and the type of drive, but SSDs provide a number of different stats that are worth paying attention to every so often. 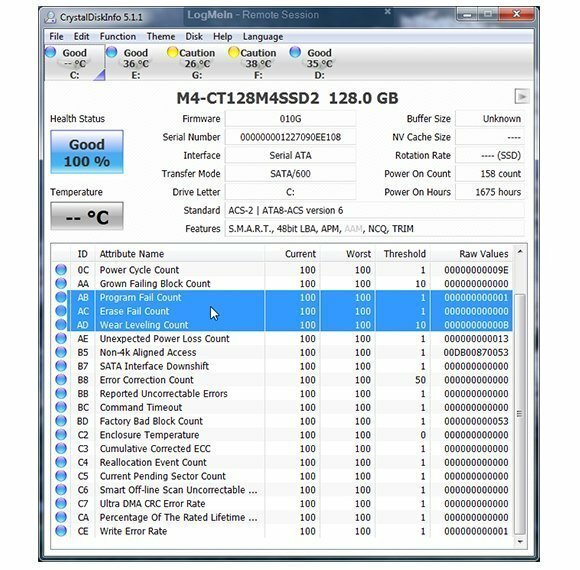 A program like CrystalDiskInfo can provide you with both a general health level for the drive as well as detailed reporting about individual statistics. The stats are not bulletproof. Drives can fail for reasons that have nothing to do with what is reported by SMART, but can be useful as a way to pre-emptively eliminate possible issues. SMART stats for an SSD drive via CrystalDiskInfo. Note the "Program Fail Count," "Erase Fail Count" and "Wear Leveling Count" stats, which are unique to an SSD and help assess its overall health. Do be mindful of firmware upgrades. SSD drives have a firmware layer that may be updated periodically by the manufacturer to fix bugs or improve performance. My own Crucial M4 drive, for instance, had a firmware update published for it in August 2012, which fixed a number of strange issues (including one where the system would crash upon resuming from hibernation). If you plan to roll out a whole slew of SSDs to systems across your organization, your SSD maintenance burden might be lighter if you stick with one manufacturer, making it easier to track firmware releases for them.